Tree-lined, Spanish moss festooned Butler Mill Road. 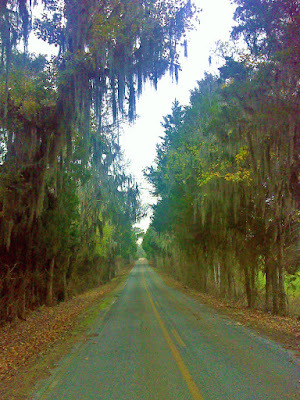 It was a dirt road when first designated as the ECT/GET route, but paving it has taken away none of its charm. I'm finally back on the 'true path' - the route of the Eastern Continental Trail and the Great Eastern Trail as designated by those who designate routes. I wasn't interested in the designated route through downtown Montgomery. The chaos and noise of busy streets and highways are things that I go hiking in order to avoid. Here, starting on Butler Mill Road, the designated route checks all the boxes as far as a desirable hiking route, from my point of view. Butler Mill Road gets very little traffic. Perhaps a vehicle every hour or two. There aren't many houses here. There's swamp and hunting land and working forest. There was one cute little church set out there in the middle of nowhere, and near it I knew I had returned to the fold of the faithful (GET/ECT hikers, that is) because I spotted the first yellow blaze since I left the Coosa Trail at Hatchett Creek. By afternoon it was hot and muggy. Crossing this pretty sandy stream I was tempted to plunge in. Right there in the middle of the road I came upon a snake lounging in the shade, seeming to be recovering from a sunny crossing. I didn't know what kind of snake it was. It didn't look threatening - indeed it wasn't moving at all, even though it surely saw me. So I got closer. Still it didn't move. So I got within six inches of its head to take a good head shot. Notice the dark pit between the eye and nostrils. I should have realized. This is a pit viper. Pit vipers are venomous. 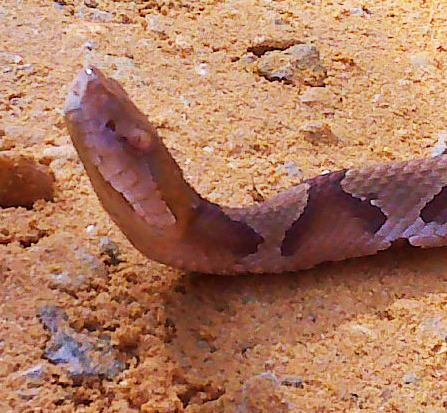 This was a southern Copperhead, something I'd never seen before. I was only familiar with the much darker northern copperhead from my many treks in the Pennsylvania woods during my youth. This reminded me more of the harmless Milk Snake or Chicken Snake. And as a result I was thinking 'harmless' rather than seeing the obvious danger signs. Fortunately pit vipers are sluggish during the day. They hunt at night when their heat-seeking infrared pit sensor works better. This one never did move, or I might be posting this from a hospital, or from beyond the 'Pearly Gates'. These are the kind of stupid mistakes one doesn't make twice. I'm out of my home territory. I need to be far more cautious. By jove, I'm still trembling. Below is a map of the route taken on this eventful day. Fortunately it didn't end there on Surles Road. I live to hike another day - hopefully just a bit wiser for the experience. Vipers in the US also have elliptical pupils. Glad you didn't get bitten.